Thus was born the D10 Turbo. We realised that there are absolutely no compromises to be made when it comes to home and personal security, and that a gate motor was needed that would offer the whole package without skimping on the essentials. Like a fine, high-performance sports car, the D10 Turbo was originally built for speed. With a top speed of 50 metres per minute, this expeditious operator opens and closes lighter gates at a velocity that can only be described as “lightning-like”. The benefits to having such a speedy sprinter for a gate motor is twofold: Firstly, there are few things in life more frustrating than coming home after a long day’s work and having to wait for an entrance gate to creep open at a pace akin to that of an aged sloth. The second benefit has to do with seated poultry. Yip; when we have to wait for a slow gate to allow us into the property, we become sitting ducks for criminals. 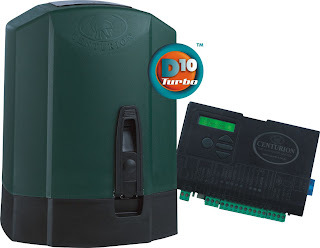 The D10 Turbo allows for ultra-fast opening and closing, leaving potential intruders in the dust. So that’s speed covered. But what about power? Simply put, the D10 Turbo has plenty of it, and is able to run gates weighing up to a ton if the operator running speed is adjusted accordingly. The table below denotes the maximum operator running speed with corresponding maximum gate mass. Even with an extremely heavy load, the D10 Turbo runs like greased lightning. Finally, there is the issue of intelligence. Suffice it to say, the advanced D10 Turbo electronic controller will score in the top of its class if it ever had to take a SAT test. Its user-friendly LCD interface and easy-to navigate menus make it the smartest industrial gate motor by far. Speed, power and intelligence – it’s all in a day’s work for our fastest operator yet!